With the heat of summer, the body often yearns for the cooling sensation of ice cream. This year, for the first time since I learned two decades ago that I have diabetes, I succumbed to the temptation. But, until now, I have refrained from writing about ice cream so as not to lead anyone too far down the slippery slope of gluttony, also known as "pigging out." Few of us can limit our indulgence to half a cup or less in a sitting. I can't. But now that the fall equinox will arrive in less than a month, we have only a short window left to test our willpower. 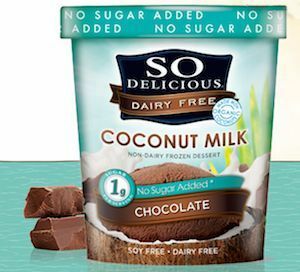 So this is the time to review some of the relatively low-calorie, low-carb, and/or low-sugar ice cream brands on the national market. This is the other end of the richness spectrum from splurging on HÃ¤agen-Dazs or Ben and Jerry's. It's inevitably also at the other end of the taste spectrum. But that might be a good thing if that restrains us from binging on too much of a good thing. Actually, they all taste good enough for my unsophisticated ice cream taste buds, but each of the three of the brands that I've been able to find have some ingredients that I normally choose to avoid. Conveniently for our comparisons, each brand comes in a one-pint container. Less conveniently, the "nutrition facts" panel on each container says that the serving size is half a cup, undoubtedly due to the Food and Drug Administration's size requirements. The FDA has, however, begun to realize how unrealistic some of their serving sizes are, and we can hope that this will change. Meanwhile, we always need to check out the serving size on any package we buy. Earlier this summer, a public relations person representing Halo Top Creamery started me down the slope by writing to offer me coupons for four pints of their ice cream. Who could resist such an offer? Halo Top is the new kid on the block, first hitting grocery store freezers two summers ago. 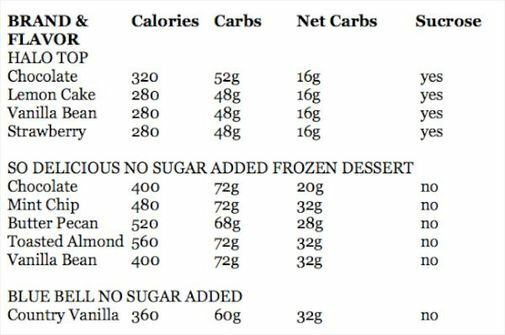 For your convenience here, I have laboriously multiplied by four each of the numbers for calories, net carbs, total carbs, and sucrose to account for the contents in each 1-pint container. 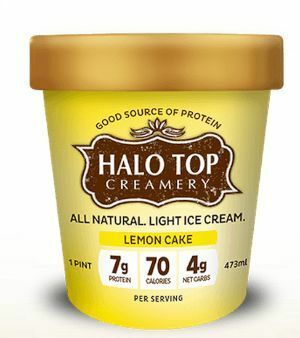 Of these three brands, Halo Top is the clear winner in being lowest in calories, total carbohydrates, and net carbs. It is, however, sweetened in part with "organic cane sugar. " I avoid all foods that have any cane or beet sugar, or any other source of sucrose, because sucrose is half fructose (the other half is glucose) which is the most dangerous sugar, as I have written here. It's also totally unnecessary and completely avoidable (except when we eat out). These ice creams are each lower in fat than most, so they need to use thickeners. The thickeners that Halo Top use are carob gum and guar gum, which have good reputations. 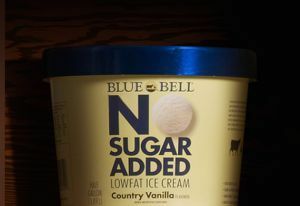 However, So Delicious and Blue Bell each use carageenan, which is questionable, according to two experts whose advice I trust, Chris Kresser and Andrew Weil. The So Delicious products here are, of course, not really ice cream at all. They come from coconut milk, which doesn't make much difference to me in terms of taste. I like the taste of their chocolate coconut milk as much as any of the others. So Delicious' labeling does disturb me in one respect. The containers of each of their five flavors state that they have "1g sugar per serving. " While that is undoubtedly true, it refers to the sugars section of the Nutrition Facts label that the FDA requires. This doesn't take into account the fact that when carbohydrates get into our bodies, it doesn't make any difference whether they are sugars or starch. In the course of my duty to report my findings, I have sampled each of these "low sugar" brands. I have not, however, gone so far as to consume each one of the many flavors. Now that summer is over and I am able to report my findings here, I have completed my ice cream research. But what about your own research? Have you been able to find any better brands?